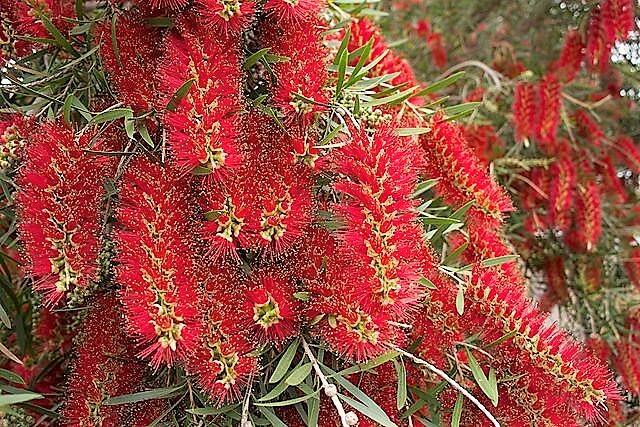 Native to Australia, the bottlebrushes - Callistemon species and cultivars are amongst some of the most exotic ornamental flowering shrubs available for the suburban garden. Some of which are hardy enough to grow outside in the milder regions of northern Europe without the need for winter protection. One of the most striking and easily grown on the impressive Callistemon viminalis. Commonly known as the 'Weeping Bottlebrush' or 'Creek Bottlebrush', Callistemon viminalis (now reclassified and correctly known as Melaleuca viminalis) is an attractive large evergreen shrub or small tree native to New South Wales, Queensland and Western Australia. It was first formally described in 1788 by German botanist Joseph Gaertner (12 March 1732 – 14 July 1791) in his best known work on seeds 'De Fructibus et Seminibus Plantarum'. The species name viminalis is derived from the Latin word 'vimen' meaning pliant stem - referring to its weeping habit. It is a surprisingly robust species which can cope with climates ranging from cool-temperate to semi-tropical meaning that it can be grown successfully n the milder regions of Great Britain. 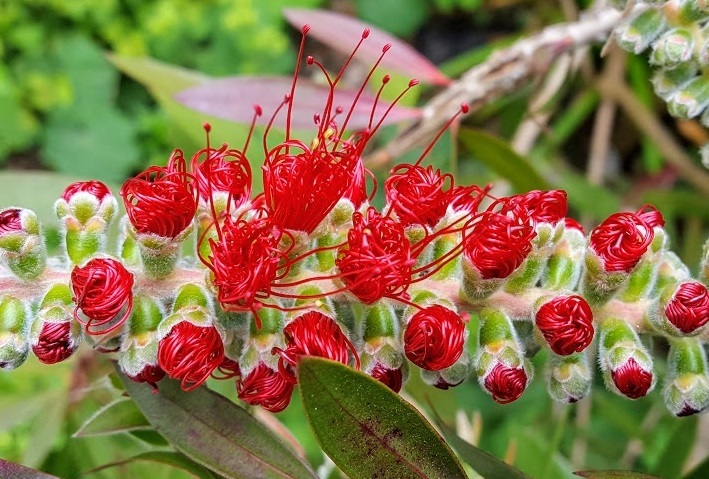 The cultivar Callistemon viminalis 'Captain Cook' is the most commonly found in production and is arguably the most popular and widely sold of all species and cultivars within the Callistemon genus. Under favourable conditions you can expect it to grow to approximately to 10 metres tall although the 'Captain Cook' cultivar attains a more manageable 1.5–2 metres. The dark-green, aromatic leaves are linear to lance-shaped, and when rubs release a pleasing lemon-like scent. The blooms are produced on cylindrical spikes, the axis of which grows on to produce new foliage. The long, showy stamens are the notable feature of this species, hence the popular common name of 'Bottlebrush'. Grow in a sheltered position in full sun, although the further north you are you will need to consider planting it against the protection of a south-facing wall. In parts of the country with experience long periods of freezing conditions cover with several layers of horticultural fleece. Alternatively grow Callistemon viminalis as a pot grown specimen so that it can be brought in under protection until the spring. In its natural habitat Callistemon viminalis is usually found growing in and along watercourses, on soils over sandstone or granite. With this in mind it makes sense that it will perform best in a moist but well-drained soil, however avoid planting in shallow soils over chalk.